Since the invention of air travel, the world has felt like a smaller place – it’s now possible for pretty much anyone to fly around the globe, learning about different countries and cultures. It’s pretty amazing. But some companies aren’t satisfied with this – they want to make the world seem even smaller, with faster, more efficient and more comfortable methods of transport. Ever dreamed of exploring the Australian Outback but been put off by the long flight? A Virgin Galactic flight from London to Sydney might take two hours within the next decade. Here are four methods of futuristic transportation that are going to change how we travel around the world. Sure, supersonic jets don't seem new or futuristic. In fact, Concord retired from service 15 years ago, and since then supersonic air travel has been reserved for the military. But now, there are a number of startups working on the next generation of supersonic air travel – promising faster, quieter and more efficient journeys than ever before. 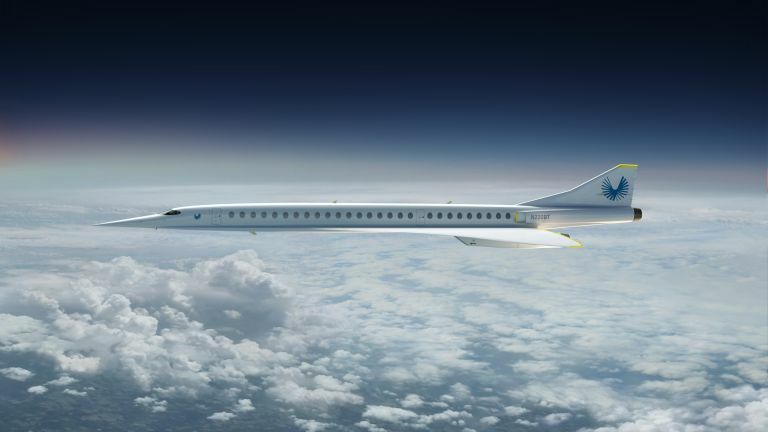 The most well-known company working towards this goal is Boom, which plans to create a 55-seater commercial airliner that will fly at Mach 2.2 (slightly faster than Concord), crossing from London to New York in around 3 hours 15 minutes. Seats will be priced at around $5,000. New breakthroughs in material and engine technology will also increase the fuel efficiency of supersonic jets, and will likely be comparable to a business class seat on a subsonic jet. A Boom jet will take to the skies next year for testing, and the company hopes to carry its first paying passenger in 2025. Oh, and worried about noise? There are companies working on ‘boom-less’ flight, travelling at supersonic speeds without the supersonic boom reaching the ground. First introduced by Elon Musk, a Hyperloop system is intended to move passengers or cargo at airline speeds at a fraction of the cost of air travel. The Hyperloop concept uses an electric motor to accelerate and decelerate an electromagnetically levitated pod through a low-pressure tube. The vehicle will glide silently for miles at speeds up to 670 mph with no turbulence. The system is designed to be entirely autonomous, quiet and on-demand. Hyperloop One has completed construction of a 500-metre Development Loop test track in North Las Vegas and in May 2017, held its first full-scale Hyperloop test. Its goal is to be up and running by 2021. There are a number of cities hoping to be the first to get the new transport system, including some in the UK. There’s one proposed route between London and Edinburgh, and another between Glasgow and Liverpool. There are a number of companies working in the space tourism industry, but it’s another one of Mr Branson’s endeavours, Virgin Galactic, which is the most well known. Virgin Galactic's flights are not like traditional rocket launches. Instead of a vertical launch, you'll start your journey in the six-seater spaceship attached to a lightweight plane known as the Virgin mothership, VMS Eve. VMS Eve will take off at sunrise and slowly climb to around 50,000 ft. At this point the spaceship detaches and the hybrid rocket will kick in, pushing 3.5 Gs. You'll accelerate from 140 knots to the speed of sound in 6.5 seconds. The pilot will then pitch the nose up and continue to accelerate vertically, going on to reach four times the speed of sound. Outside, the sky will change from blue to purple to black – you'll be able to see this from the front windows, as well as the nine large windows on the side and roof of the ship. These are double the size of traditional aeroplane windows. The spaceship will reach its peak altitude and remain in space for around six minutes. It'll be dead silent. During this peak, the seats will fold away and you'll experience zero gravity, float around, and have your picture taken. The feather mechanism will kick in, changing the shape of the ship, as it begins to glide back to Earth. It then lands back in New Mexico like a regular plane. The whole flight takes around two hours. At the moment, that journey will cost you $250,000. That's clearly a lot of money and only accessible to the super rich (although one or two people have taken out mortgages to fund the flight). In the future, however, as the ships get larger and can take more people, we could see the introduction of suborbital intercontinental travel. For example, who says the plane has to land again in New Mexico? You could fly anywhere in the world in under three hours. Richard Branson has predicted that within a generation it will be possible to fly from Australia to London in less than two hours. Self-driving cars have the potential to make travelling easier and safer than ever. Getting around an unfamiliar city could be as simple as opening an app and hailing an autonomous car. Technically speaking, self-driving cars are already on the road, thanks to a number of brands – but they're not legally allowed to fully drive themselves yet on public roads, and may not be for a while yet. There is a long list of companies working on self-driving vehicles, from traditional car manufacturers such as BMW, Audi and Volkswagen, to tech companies such as Uber, Tesla and Google. The most notable company in this field is Tesla, which is constantly rolling out software and hardware updates for its cars to improve their autonomous capabilities little by little. Its Autopilot system can already drive a car better than a human, Tesla says, though right now you're only legally allowed to use it to help you stay in lanes on a motorway, change lanes when needed, and adjust the car's speed based on the traffic around it. The emergence of smart roads will make travelling by car even easier. These smart roads will be able to instantly communicate with your car about traffic, parking spaces or hazards, and help you navigate your way around an unfamiliar city.